One of the most critical times in a project’s life-cycle is at the very beginning – before mockups, before a single line of code is written, before any money is spent. Effective project planning will help your team define project goals and create the frameworks necessary to ensure these goals are realized. 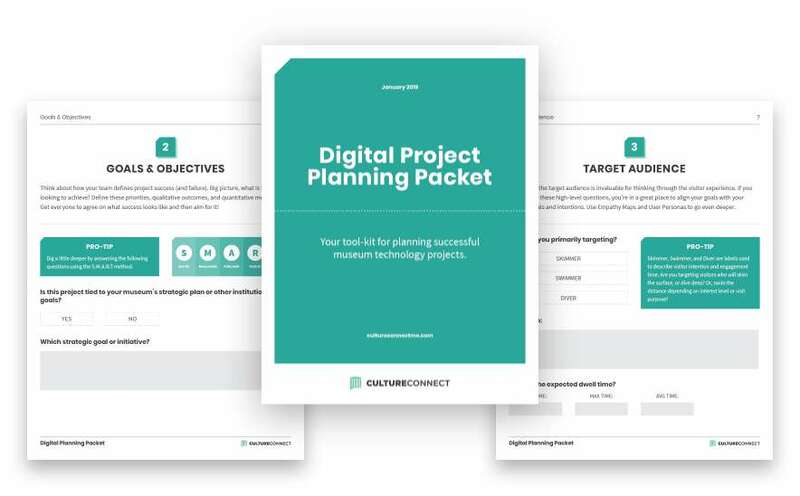 Download the Digital Project Planning Packet here to get started, and for those of you new to project planning, we’ve introduced a few project management concepts and best practices below. The Digital Project Planning Packet has 12 main topics, or sections. We have honed these concepts in workshops and webinars, and, as always, if you need help, reach out and we’ll walk you through the process. It’s important to define your project scope and objectives. This will help establish what the project will and won’t accomplish which ultimately builds consensus, eliminates misunderstandings, and sets appropriate expectations to prevent problems down the line. What is the project aiming to achieve? What is success and what is failure? Achievement can be accurately measured only if teams are evaluating the project using the same success metrics (qualitative and quantitative). Get everyone to agree on what success looks like and then aim for it. Identifying the target audience is invaluable for thinking through the visitor experience. If you can answer the 7 questions in the packet, you’re in a great place to understand your visitors. Use Empathy Maps and User Personas to define your audiences even more deeply. Identifying key stakeholders helps on a few fronts; by thinking through all of those involved in the production and approval of your project, you’re helping to ensure all parties are kept in the loop at the right time and your timeline reflects a realistic process. Working through a budget is not just about upfront costs but also long-term maintenance and recurring costs. Work through these questions but also check out our article on Navigating the Budget Process. Both are important for understanding the resources needed to successfully run your program for the long-term. Project stakeholders should have a clear sense of how long this project will be live and how it will be maintained so that end of lifespan is not evaluated as a failure. We recently went in-depth about maintenance. Here’s a moment to think through who is fulfilling the project requirements and how the details of the project are being communicated effectively to all involved parties. From in-house production to sourcing vendors, we ask the essential questions. Not to state the obvious, but project schedules are essential to allocating resources and helping guide a team toward a successful launch. We ask you to establish a high level timeline to reflect key (and achievable) milestones. The timeline should be updated as the project evolves. It’s helpful to think through dependencies and possible obstacles as well. We’re big fans of Gantt charts at CultureConnect but there are tons of tools out there, so use what works best for you and your team. While the details of hardware and software installation, connectivity, and devices may not be in your purview as project manager, these items are essential to launching projects as well as planning for maintenance and the budget. Tear these sheets out and pass them to your IT/AV experts so that you can establish an achievable maintenance plan. Who is producing your content? Often these tasks are distributed between in-house resources and outside vendors. In many cases, final design and software is dependent upon final content. Here’s your chance to establish roles and responsibilities, communicate deadlines, and spotlight any potential conflicts between content production, design, and software production. There is a lot to think through before launch. Often staff needs to be trained on how to use software, how to care for hardware, and how to talk to visitors or senior stakeholders about the project. Those who need training can range from IT/AV staff, docents and visitor services staff, to security guards. Here is another great section to tear out and handoff to your marketing gurus. Make sure that your marketing team has enough time to prepare materials and get word out to ensure your project ends up in the hands of your visitors. Like the Digital Project Planning Packet, but want more in-depth tools for some of the topics above? We’ve got you covered! Look out for upcoming add-on mini-packets to supplement the core Digital Project Planning Packet we have here.